With our Salesforce integration you can display customer information from your Salesforce account in the conversation view. Informations is searched by the customer's phone or email address depending on contact channel. 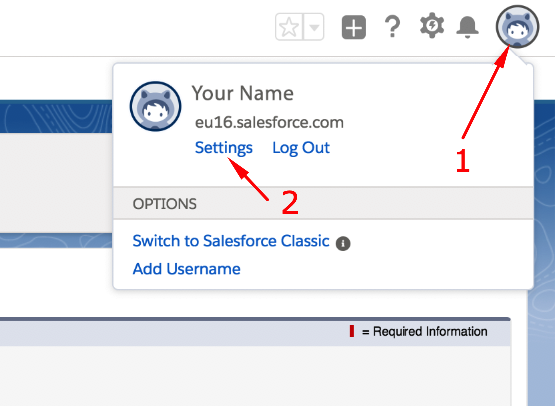 Custom fields including translations will be retrieved from your Salesforce account. Click the cogwheel and select Setup. 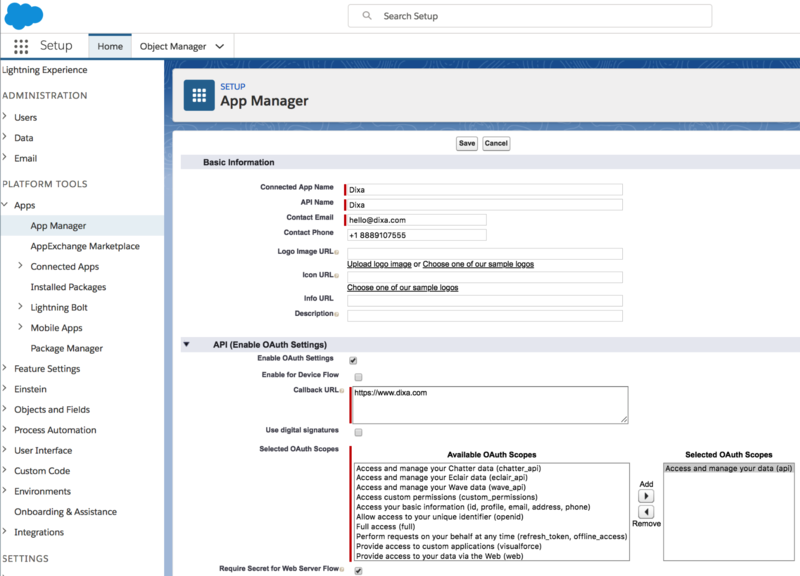 Go to PLATFORM TOOLS > Apps > App Manger. Selected OAuth Scopes: Add Access and manage your data (api) to Selected OAuth Scopes. Check Require Secret for Web Server Flow. 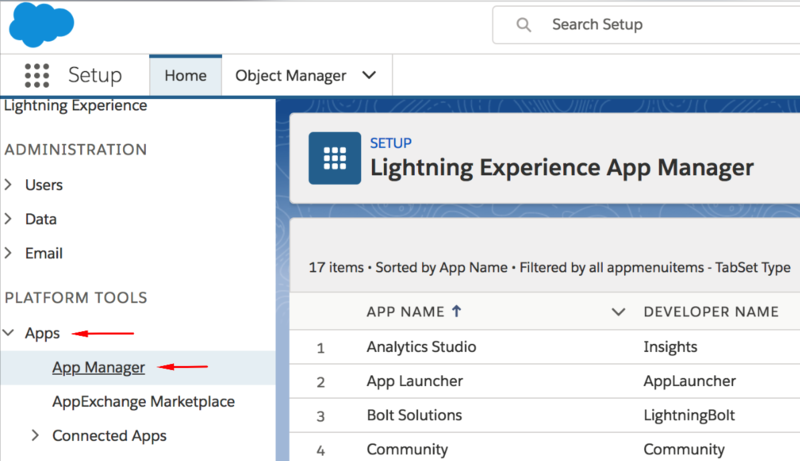 Go back to PLATFORM TOOLS > Apps > App Manger. Find the Dixa under APP NAME and click View to the right of the row. Click Click to Reveal under Consumer Secret and copy Consumer Secret. 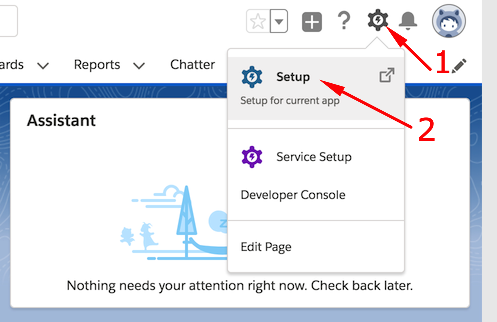 Click the Astro mascot icon in the top right corner and select Settings. Search for security in the top left corner. NB! If you reset the Security Token at a later time, your Dixa integration will stop working. 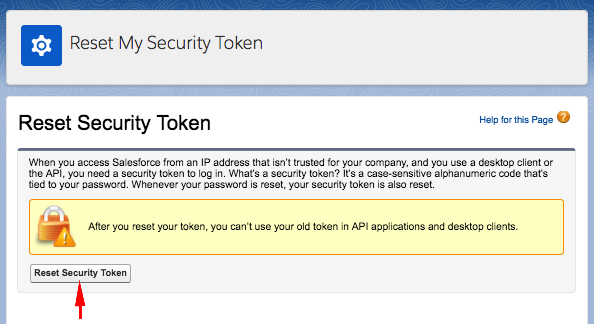 Copy the Security Token from the email you receive from Salesforce. Click on the cogwheel and then Setup. Go to Apps > App Manager. Fill out the required Basic Information and API (Enable OAuth Settings). 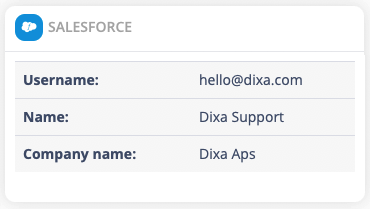 Find the Dixa app under Apps > App Manager. Click View to the right of the column. Click on the Astro mascot and then click Settings. 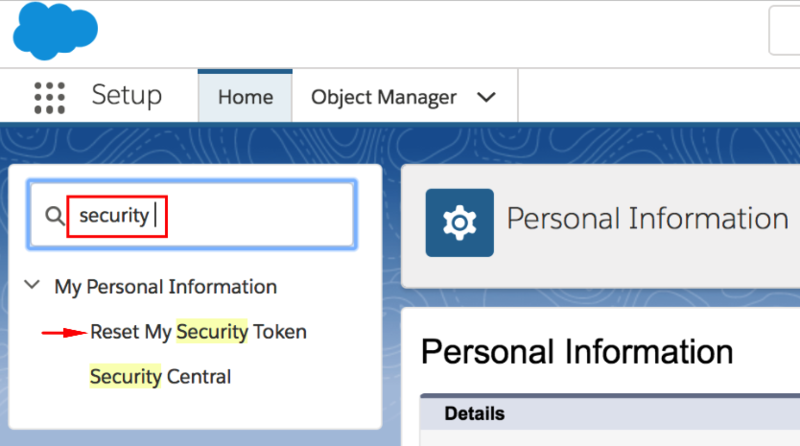 Search for security and click Reset My Security Token. 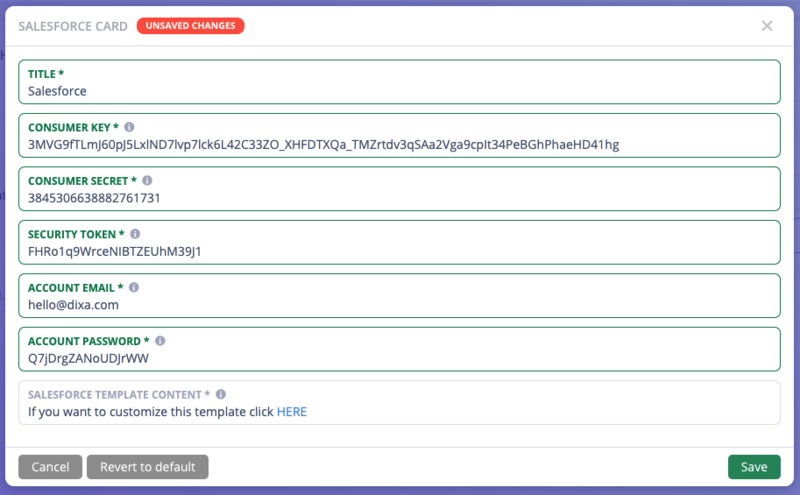 The security token will be sent to your Salesforce administrator email address. 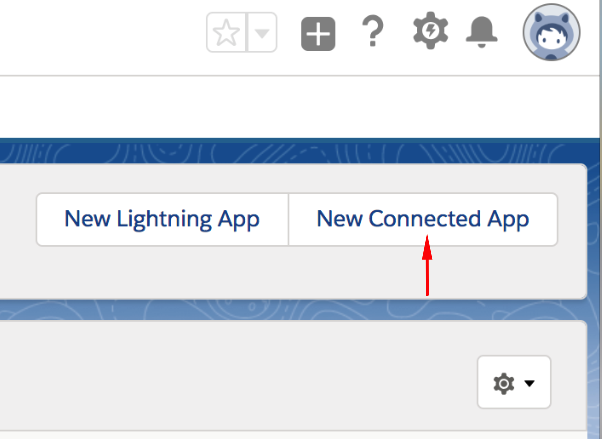 Click in Configure Integration under the Salesforce icon. Enter a Tile for the card (ie. 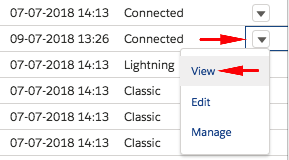 Salesforce information). Enter Consumer Key, Consumer Secret, Security Token, Salesforce Administrator Account Email, and Salesforce Administrator Account Password. 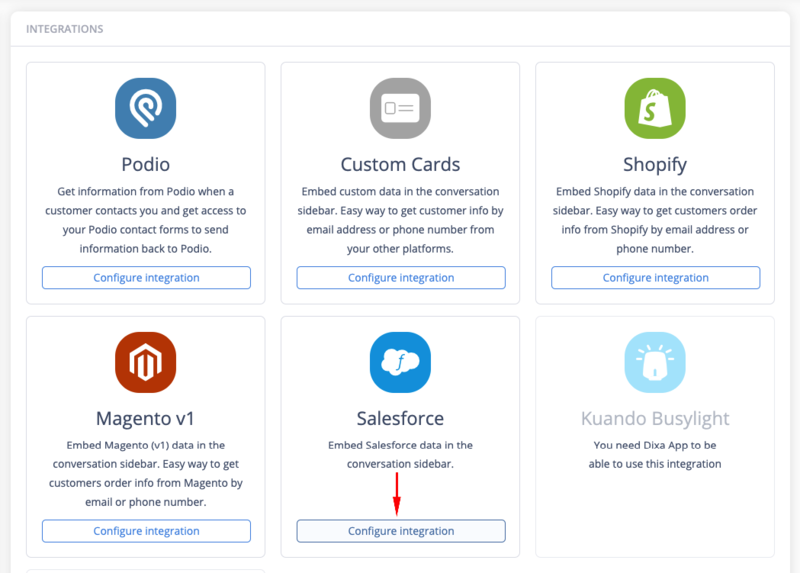 Go to Settings > Integrations and click Configure Integration under Salesforce.